Winter is over, and spring is in full swing and eureka springs, Arkansas. Now is the time of the year when motorcycle enthusiasts start to feel the call of the open road. Many would argue that Fall Motorcycle Rides are the best in and around Eureka Springs. But the spring season has much to offer with blooming trees and rushing waterfalls. Don’t wait, start planning your Eureka Springs motorcycle adventure today! Eureka Springs is a motorcycle-friendly town with many eclectic shops, bars and restaurants. Most of Eureka Springs Lodging is biker friendly and are happy to accommodate a small group with some space to hang out, show off your bikes and have fun. Look for lodging with flat and secure parking, bike wash stations, rewards programs and special discounts or added value packages. The Best Western Inn of the Ozarks offers everything you need for both large and small groups. This full-service Eureka Springs, Arkansas hotel is fully equipped to handle your rallies, no matter how big or small. 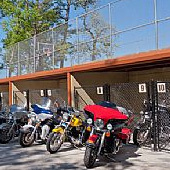 If your bike is your baby, the Inn of the Ozarks offers new, covered & secured motorcycle parking located close to your room, exclusively for motorcycle riding guests.! America’s most haunted hotel is a prime spot to park your bike on your next adventure. The Crescent Hotel is a biker friendly hotel that is perched atop of Eureka Springs. Stop by the Sky Bar for a drink and the best view in Eureka Springs! The New Moon Spa is a full service day spa to help rest after your journey. The Best Western Eureka Inn is a favorite for motorcyclists visiting Eureka Springs. Their large, level parking lot provides ample parking for your party. A large heated pool and hot tub is the perfect thing after a long day of riding. Don’t pass up the potential to earn points with their Ride Rewards program and their 2 Wheels = Great Deals promotions! If the nightlife is your scene, why not stay in downtown Eureka Springs? The Basin Park Hotel is a great place to relax from that long ride and grab some drinks and a bite to eat outside at the Balcony Restaurant, offering best view of downtown! Walk to nearby attractions or enjoy the great amenities that the hotel offers! 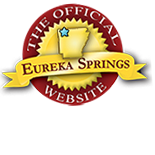 Be sure to check out EurekaSprings.com for a full listing of lodging and attractions. Take a look at our Eureka Springs Motorcycles page for in-depth looks at famous routes and motorcycle specials. This entry was posted on April 13, 2017 by service424 in Basin Park Hotel, Crescent Hotel, Eureka Springs Lodging, Motorcycle Friendly Lodging, Motorcycle Maps, New Moon Spa, Road trips and tagged deals, Eureka Springs, maps, motorcycle, motorcycle deals, motorcycle parking, motorcyclists, ride eureka, rides.